The study was conducted on 168 young pigs on an authentic farm environment and was carried out over a 23-week period by eight researchers across Australia and the USA. The lead researcher, Dr. Judy Carman, is from the Institute of Health and Environmental Research in Kensington Park, Australia. The study has now been published in the Journal of Organic Systems, a peer-reviewed science journal. 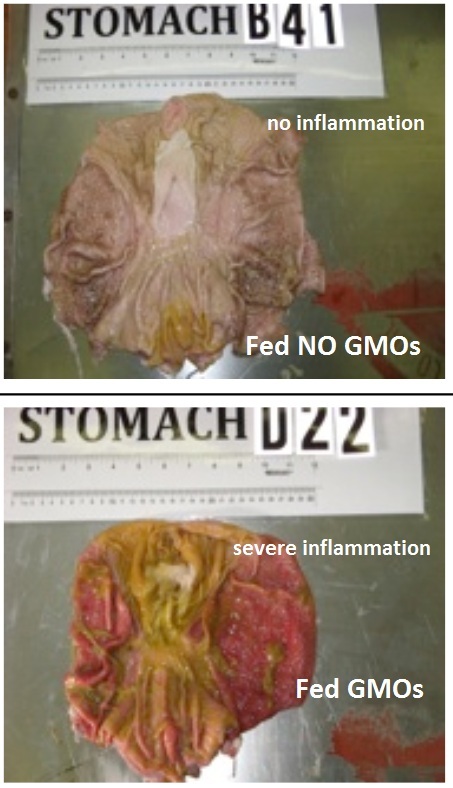 The study is the first to show what appears to be a direct connection between the ingestion of GMO animal feed and measurable damage to the stomachs of those animals. Tests also showed abnormally high uterine weights of animals fed the GMO diets, raising further questions about the possibility of GMOs causing reproductive organ damage. Proponents of corporate-dominated GMO plant science quickly attacked the study, announcing that in their own minds, there is no such thing as any evidence linking GMOs to biological harm in any animals whatsoever. And they are determined to continue to believe that, even if it means selectively ignoring the increasingly profound and undeniable tidal wave of scientific studies that repeatedly show GMOs to be linked with severe organ damage, cancer tumors and premature death. "Adverse effects... toxic effects... clear evidence"
The study was jointly announced by GM Watch and Sustainable Pulse. Lead author of the study Dr. Judy Carman stated, "We found these adverse effects when we fed the animals a mixture of crops containing three GM genes and the GM proteins that these genes produce. Yet no food regulator anywhere in the world requires a safety assessment for the possible toxic effects of mixtures. Our results provide clear evidence that regulators need to safety assess GM crops containing mixtures of GM genes, regardless of whether those genes occur in the one GM plant or in a mixture of GM plants eaten in the same meal, even if regulators have already assessed GM plants containing single GM genes in the mixture." 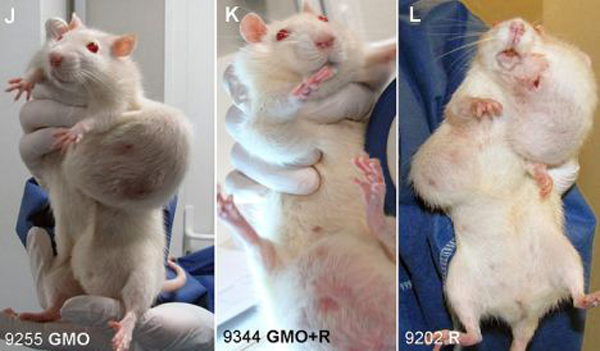 The study adds to the weight of scientific evidence from others studies which show that rats fed a diet of GMOs grow horrifying cancer tumors and suffer premature death. A scientific study published last year concluded that eating genetically modified corn (GM corn) and consuming trace levels of Monsanto's Roundup herbicide was linked with rats developing shockingly large tumors, widespread organ damage, and premature death. That study was also criticized by corporate GMO trolls who argued that scientists should not show pictures of rats with large cancer tumors caused by GMOs because the pictures scare consumers into being afraid of GMOs. That study also found that rats fed GM corn suffered severe kidney damage as well as shockingly high rates of premature death. Why weren't these studies done before GMOs were unleashed into the global food supply? The GMO biotech industry was able to escape any meaningful regulation of GMOs in the United States by (ridiculously) claiming GMOs were substantially no different from non-genetically engineered crops. "They're all the same!" we were told. And the USDA bought it. So how did Monsanto patent its GM corn, then? You're not supposed to be able to patent something unless it's uniquely different. Thus, the very fact that Monsanto has acquired patents on its GMO crop varieties is proof that the company itself believes its seeds are different. And what's different about Monsanto's GM corn? It produces a deadly insecticide grown right into every kernel. That insecticide, of course, is what kills insects that try to eat the crop. And how does it kill those insects? It fatally damages their digestive systems. That same insecticide stays inside the corn even as the crop is turned into animal feed... or corn chip snacks... or flaked corn breakfast cereal. 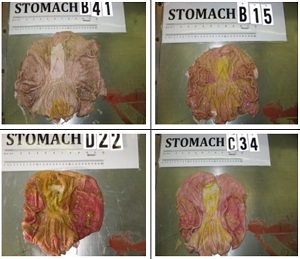 This pig stomach inflammation study suddenly provides yet more credible evidence that GMOs are unfit for human consumption and may be causing severe damage to the digestive systems of both humans and mammals. Naturally, the GMO industry and all its paid online trolls, on-the-take "scientists" and multi-million dollar P.R. machine will try to viciously attack this study from every angle. They absolutely hate real science when that science calls into question their poisonous, deadly seeds and genetic pollution. That's why you won't read this news anywhere in the mainstream media -- the same media that utterly discredited itself a few weeks ago when it pretended the hugely successful global March Against Monsanto never even took place. Warning: Monsanto's GMO soy could give you blue balls!